Welcome to another Tool Time Tuesday!! 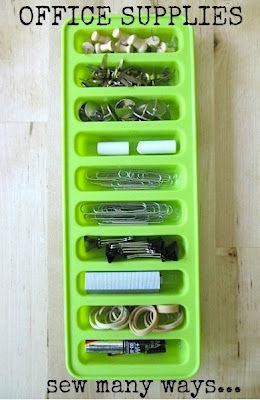 Today's "thinking outside the box" idea is an ice cube tray organizing tip. This ice cube tray makes those long skinny cubes that fit in water and drink bottles. I found this one in a discount store for $2.49. Ice cubes? 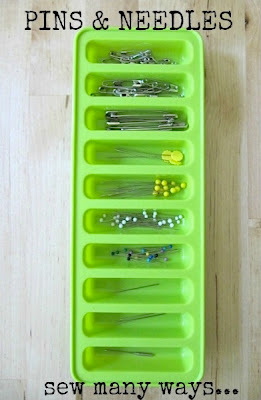 Maybe not for me, but great for organizing so many things. It's made from silicone, so it's very rubbery and pliable to get the ice cubes out. 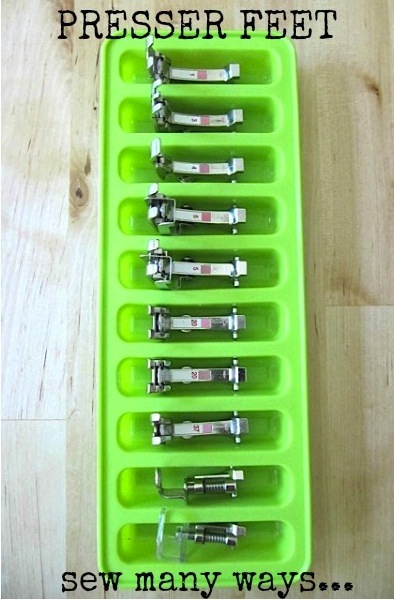 All your presser feet for your sewing machines...soft compartments keep them safe and sound. and it's perfect to "grab" all your bobbins. The silicone is pliable to stretch around the bobbin, yet it holds it in place so they don't roll around or fall out!! Perfect for office supplies too, if your desk is limited on drawer space. Don't forget all those little screws and nails. 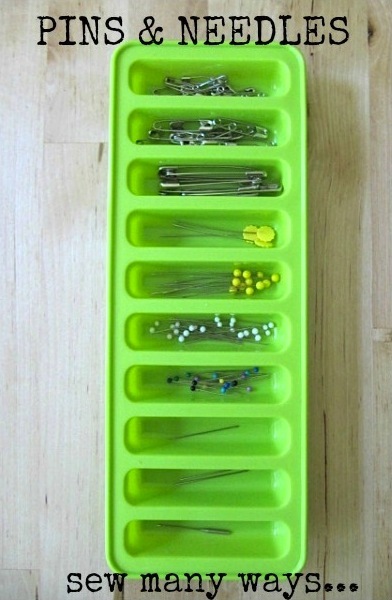 This is great for the kitchen drawer to keep little things handy, so you don't have to go in the garage or basement for a small nail to hang a picture. 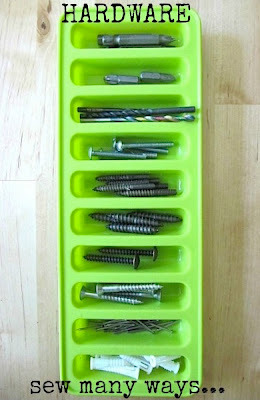 I'm sure there are so many other ideas we can use this tray for...stretch your imagination and see what things you can fit in here. Add your ideas in the comment section too!! Wow! Another great idea! Thank-you! I was looking for some thing to put earrings in , a regular ice cube trays would be perfect I've even seen them with tops on and bracelets in the long size you are showing today I don't wear big jewelry so I'm sure they would fit . .Thank You once again .I'm off to the dollar store . I love that you see something like this and have a million ideas for it. I think you can use it also to store mosaic tiles or glass tiles divided by color! It can be useful to have them all tidily at hand while creating mosaic decorations. I can imagine a tray with all the colors of the rainbow, wonderful! How about for bobby pins, hair clips and bands for pony tails? Little girls have tons of those! It would be great to put paint in while painting. Thanks for getting the inspiration rolling! Great ways to use the ice cube trays! I especially love the bobbins tip too. Lol, Am I so old that I find it funny you have to expain what an ice cube tray is?? In my day, there was no such thing as an ice machine! I can still remember when it a big deal upgrade to have the dispenser on the front of the freezer. I'm pretty sure my mom still her old blue platic ones. Nice to know they are still useful for something! Hi Susan! I still use the blue plastic ice cube trays that you twist to pop out the cubes. I dream of the day our old fridge will die and I can buy one with an ice maker and water dispenser on the door. Meanwhile I wonder whatever happened to those oh-so-cool aluminum trays of my youth. Remember the ones that had the cube "part" separate and you would pull the handle up to break the cubes free? I love Tool Time Tuesday! 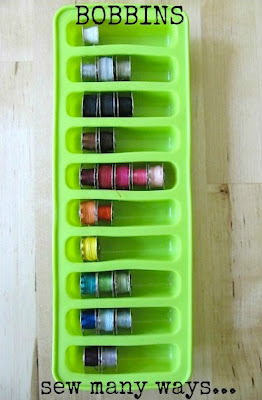 Fantastic idea about using these for bobbin storage! I use that exact same tray to freeze ... leftover pesto ... leftover tomato paste ... grated ginger. Then I pop them into a ziplock bag and they are there when I need just a little bit. 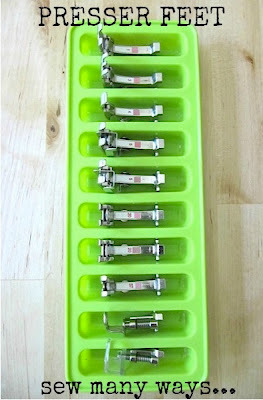 Best storage idea for sewing machine feet that I have seen. I love the bobbin idea the most. I'll be on the lookout for one. What a great idea. I've been looking for a solution to the mess in my computer and this just may do it. Thank you. For YEARS, I have used several ice cube trays for my jewelry. HINT: It's so easy to scoop up earrings, etc. with just a finger. That's why I love to use ice cube trays for my jewelry. 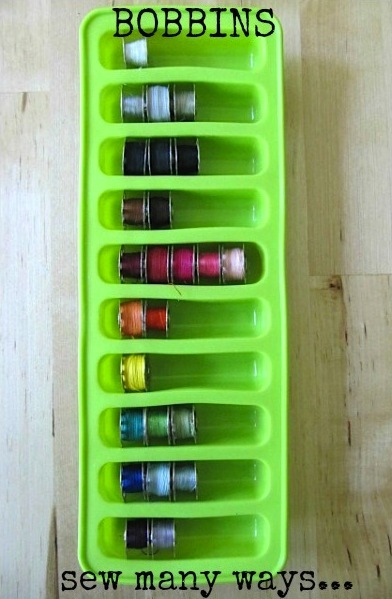 I love the idea for using this for bobbins! 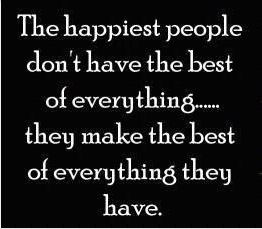 Mine are currently all thrown in a drawer... I'll be adding one of these to my shopping list! You're so smart! I've never seen these before. Thanks for the idea for storing presser feet. Now they won't all be in a jumble. OMGosh I'm so getting one of these for my presser feet! I am also going to label the inside for each foot! My new machine came with so many it is ridiculous! I'm going to look for one in that shape for bobbins. Great idea!! love this idea! so clever. Hm I think it’s a great idea mostly the way of keeping tool over there. Screw, nails, grabs etc. all of these can easily adopt.thanks for this idea Karen…..